What is it with sofas that makes them so hard to buy? I agonize over the thought of picking our next sofa for the new house. In my lifetime, I’ve purchased a total of three sofas. There was the $699 microfiber cheap sectional that lasted us about 7 years and I only began to slightly hate it years 6 and 7. Then there was the $699 Ashley sofa that lasted us slightly over 2 years (we happily sold it when we moved late last year), but only looked good for about 6 months before I began to hate the damn thing. Then there’s the 6 year old velvet Chloe sofa from Macy’s that was also $699 (I notice a trend…) and we’re currently using the hell out of it in the apartment. It’s holding up beautifully, but it’s apartment sized (76” inches). I’ll likely put it in my home office to serve as a daybed once we move into the house. I don’t think I expect a sofa to last 20 years, but I do want to invest in a high quality, mid-range sofa that will look great and feel great for the next 7-10 years. I’d love to spend $699, but I realize you get what you pay for, so we’re bumping up the budget in hopes of getting great quality. I’ve done an embarrassing amount of research on sofas, and here’s the few I’ve narrowed it down. I know I want a gray hued, durable, pet proof fabric that won’t snag, so I’m leaning towards velvet. I want it to have a more transitional feel. I also want the cushions to stay as fluffy as possible since we use our sofa a lot for watching TV, hosting game nights, napping, etc. Here are my top choices along with pros and cons. The one from Room & Board I’d have to order sight unseen because there are no showrooms in Texas currently (there will be a Room & Board in Dallas late 2017). This one by Room & Board is my absolute favorite, and it breaks my heart to not get to try it out for myself. I could potentially try this out in person if I just live with our current 72” sofa until the Room & Board location in Dallas opens and we can go try it out. The silhouette is gorgeous, modern, yet timeless and the width/depth is perfect for hours and hours of Netflix. And the velvet fabric makes me swoon. 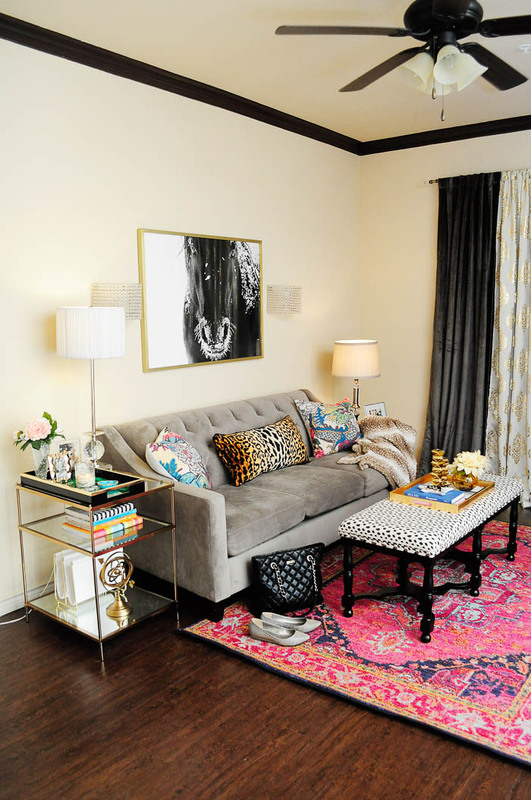 A bit more on the traditional side, the Chandler sofa from Havertys would work perfectly in our space since it will not be up against the wall. The tall back and nailheads make this a classy and substantial choice, but I’m not loving the stock fabric choices and would likely sort of “settle” for the gray one, which looks a bit green-ish on my screen. 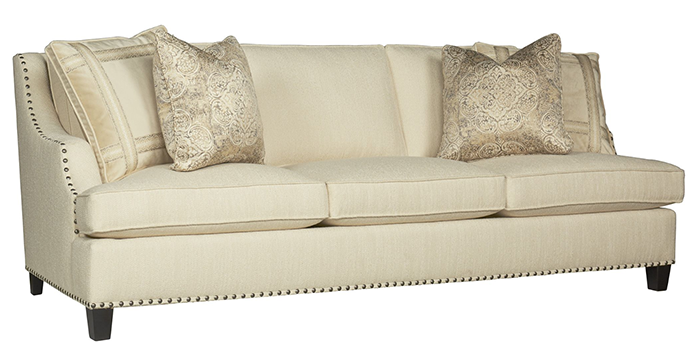 Another Havertys sofa, but by Bernhardt, I’m drawn to the classic ivory/beige color and simplicity. I could imagine this sofa looking great with any type of throw pillow, and it’s very well reviewed. My concern would be stains and Pee Wee snagging the fabric, but on the flip side Pee Wee’s hair would blend right in. I’ve also looked online and see that Lee Industries and C.R. Laine are highly recommended, but it seems I’d have to through an interior designer or official dealer, and there aren’t any around here. Those brands might also be way more pricey, and let’s face it, price is always a factor. Do you have any brands/stores/styles of sofa you absolutely love and would recommend? Drop me a note in the comments. Monica,I live in Chicago. I have been to room and board. That sofa is very firm. It looks nice in person. I couldn't quite see it the way i wanted because it was in the olive green color. i personally wanted snow. It is 90% cotton and 10% polyester velvet. The cushions are not very wide. I placed my hand against the cushion and took a picture so i could remember the width of the cushion. My hand was larger than the cushion. I love that fact that the cushions are zipped in, so i could take them off and wash as needed. It is very deep. If you want to sit all the way back you will have your feet elevated. Unless you have a pillow to prop you up against the back of sofa. Which can be good for snuggling while watching a movie with your hubby. Hope this helps! I think you should get a price on a Lee Industries sofa, you may be surprised. I am sure that you can find a designer on-line who has an account to get you the price. My vote is for the Hutton. I like the two long pillows on the seat.